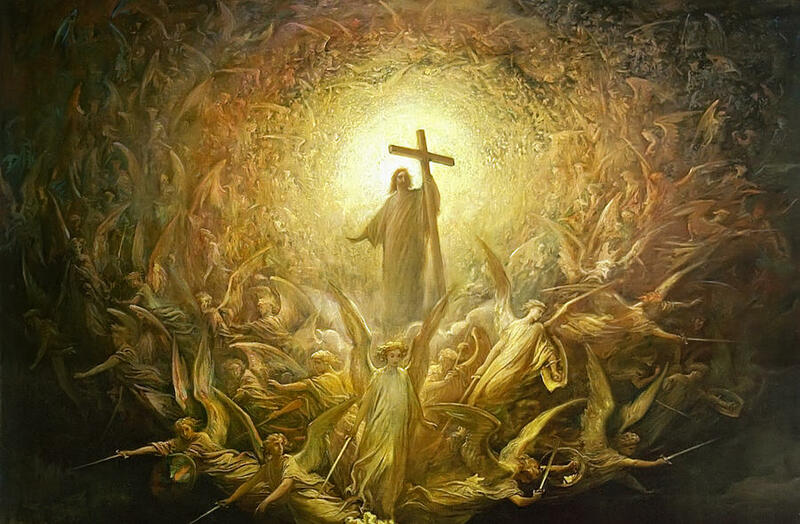 CATHOLICWEBPHILOSOPHER: BECAUSE CHRIST HAS RISEN, LIFE HAS MEANING, AND NONE OF THE GOOD WE DO IS EVER DONE IN VAIN. BECAUSE CHRIST HAS RISEN, LIFE HAS MEANING, AND NONE OF THE GOOD WE DO IS EVER DONE IN VAIN. What would it be like if Jesus did not rise from the dead? In the last chapter of his book, “The Myth of Sysiphus”, the atheist philosopher, Albert Camus tells of the legend of Sisyphus who defied the gods and put Death in chains so that no human ever needed to die again. But when Death was finally liberated and it came time for Sisyphus himself to die, he came up with a scheme that would enable him to escape from the underworld. He was captured by the gods, of course. For his punishment he was made to push a rock up a mountain; once on the top, however, the rock would roll down again and Sisyphus has to start over. Sisyphus, Camus says, is like an absurd hero who tries to live life to fullest, is in fear of death, and is thus condemned to an eternal but meaningless task. Perhaps Camus’ “Myth of Sisyphus” can give us a possible way of answering Paul’s question. If Christ did not rise from the dead nothing that we do, whether big or small, nothing of our accomplishments, however important, will mean anything. And we shall live, be born, grow up, become someone important perhaps, and then die, just like everyone else, everything we lived for erased and ultimately meaningless. Like Sisyphus, the whole of our existence would be like pushing a rock up a hill only to have it roll back down, leaving us with no choice but to push it up again, and again, and again. St. Paul answers his own question: “If Jesus did not rise from the dead, then we have lived in vain, and we have believed in vain". But Jesus did rise from the dead! He did leave the tomb. He did conquer death. And so our life is neither a staircase leading nowhere or a meaningless exercise like that of Sysiphus and his rock. Because of Easter, because of our hope in the resurrection, our lives find their ultimate purpose and destiny in God, in life eternal. But also because of Easter, nothing that we do in this life is ever meaningless, however big or small, nothing we do is ever done in vain. Because of Easter, every good deed we make, even the smallest act of kindness, becomes something of tremendous value. The road of life, the road we all must travel, can often be up-hill; filled with pot-holes of suffering, sidetracked by suffering and failure, even detoured by moments of pain and defeat. And yet we can endure the harshness of our journey because of the hope we celebrate today: Christ Risen, endless glory, lasting peace, eternal happiness.